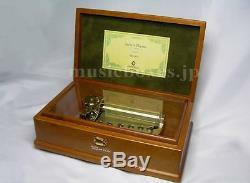 Up for sale is Sankyo ORPHEUS 50 note cylinder music box made in Japan and play the tune "Aeris's Theme" (Aerith's Theme) 3 parts from Final Fantasy VII (FF7). 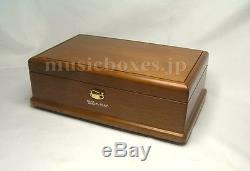 This music box is a special tune and very rare limited and was made by Sankyo Seiki Mfg. The great arrangement and the rich sound will surely satisfy you. The material of the box is solid curupixa wood and brown color half matt finish. The tune sheet is the standard sheet of Sankyo original. If you want any tempo (playing speed), please let me know first. We will as close to your wish as possible. This item might be dutiable in your country. The item "Sankyo ORPHEUS Music Box Final Fantasy VII FF7 Aeris Theme Aerith 3 parts V. RARE" is in sale since Wednesday, April 26, 2017. This item is in the category "Collectibles\Decorative Collectibles\Music Boxes\1970-Now". The seller is "adgjmpt" and is located in Japan. This item can be shipped worldwide.